To mark the 10th Anniversary of Dornoch Fibre Fest Gongcrafts have dyed a unique Anniversary Luxury Yarn pack. Clive and Laurence have thought hard about the colours of Dornoch, and this pack of 5 skeins represent the red of the Cathedral, blue for the sea and sky, the yellow of the beach and the greens of the golf course and trees that grace the town centre. The dyes used for the series include mixtures of indigo, buckthorn berries, tea leaves and cochineal. Many of these colours echo the character and style featured in the Royal Dornoch Golf Club’s tartan, commissioned to mark 400 years of golf being played in the town. The yarn is made of 75% Merino wool and 25% Silk. Each skein weighs approx 50g and measures 200m, ideal for Fairisle knitting etc. A very limited number of these sets will be offered by Gongcrafts exclusively for sale during the festival weekend. The normal retail price would be around £50 but at Fibre Fest they will be on offer at the special festival price of £40. 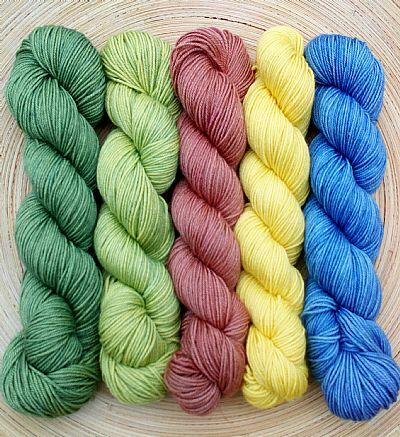 Gongcrafts are also very happy and privileged to be able to offer 1 set of these yarns as a prize in the Dornoch Fibre Fest raffle, to be drawn on 10th March.